I haven't written much about individual wines lately. I have been recording my likes and dislikes and recommendations in CellarTracker, an application which allows me to manage my wine and do research. But, I have found a wine which is one of those very special wines that plays well above its weight. 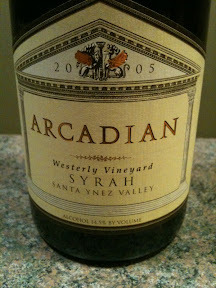 The wine is Arcadian 2005 Syrah Westerly Vineyard form the Santa Ynez Valley in California. I was introduced to this wine through an email offering form a respected wine agency and bought two bottles, sight unseen or tasted. I read the description an believed that if the wine was half as good as the write up it would be worth the price. Turns out, it is far better than that. It is a great wine that one person I served it to remarked that it was equal to $100 bottle wines he had been served. Now I don't know who can afford $100 per bottle wines, but it is nice to know that I have one that is in good company with them. One reviewer wrote: "Darn nice wine made even more impressive by the price. Rich but lively so it's not heavy at all with smoke, blackberry, earth and black pepper. There seems to be just a hint of brett (I could be wrong but myself and winemaker friend thought there was a bit) which added to the complexity without overwhelming. Good acidity and a nice medium length finish. Wish I bought more of this." Another reviewer wrote: "Bright medium red. Red and dark berries, smoked meat and Christmas spices on the nose. Midweight raspberry and bitter cherry flavors are complicated by beef jerky and floral pastille qualities. This strikes me as a blend of pinot noir and syrah, with the former variety's finesse and sweetness and the latter's game and earth character. Finishes crisp and long, leaving a peppery note behind." Recommendation: This is a great wine and I highly recommend it. At $26 per bottle it is a bit more expensive than most wines I buy--but worth the extra cost.